Efficiency begins with our fees. Every dollar you don't pay in fees is a dollar added to your investment returns. AlphaGlider receives only one form of payment — investment advisory fees on the average value of assets we manage for you. Our annual investment advisory fee starts at 0.5% for households with $200,000 to invest. How does that compare with other investment advisors? Pretty well, it turns out. Actually, very well. One of our competitors runs an account aggregation service which over 1.3 million people use to track their household net worth. They found that most of their users with investment advisors pay in excess of 1.0% in annual investment advisory fees. Note: Personal Capital and AlphaGlider fees based on a client with $200,000 in managed assets. Fund management fees are paid to the companies that manage the funds1 we use in our investment strategies. These fees are automatically deducted from the funds' share prices on a daily basis. We primarily build our AlphaGlider investment strategies with low-cost exchange-traded funds (ETFs) that are passively managed to an index2 and occassionally with low-cost, no-load mutual funds. We are completely independent from the fund management companies which supply funds to our strategies, and we do not receive back-door payments from them, unlike some of our competitors. NOTE: AlphaGlider strategy fund management fees as of December 31, 2018, and are subject to change without notice. Average equity and bond mutal fund expense ratios are simple averages during 2017 by the Investment Company Institute (2018 Investment Company Fact Book, pg 123). NOTE: AlphaGlider fund management fee is for the highest cost AlphaGlider strategy, as of December 31, 2018, and is subject to change without notice. Why do we prefer low-cost index funds? It's simple — unburdened by high management fees, index funds consistently outperform more expensive, actively managed funds over long time periods. 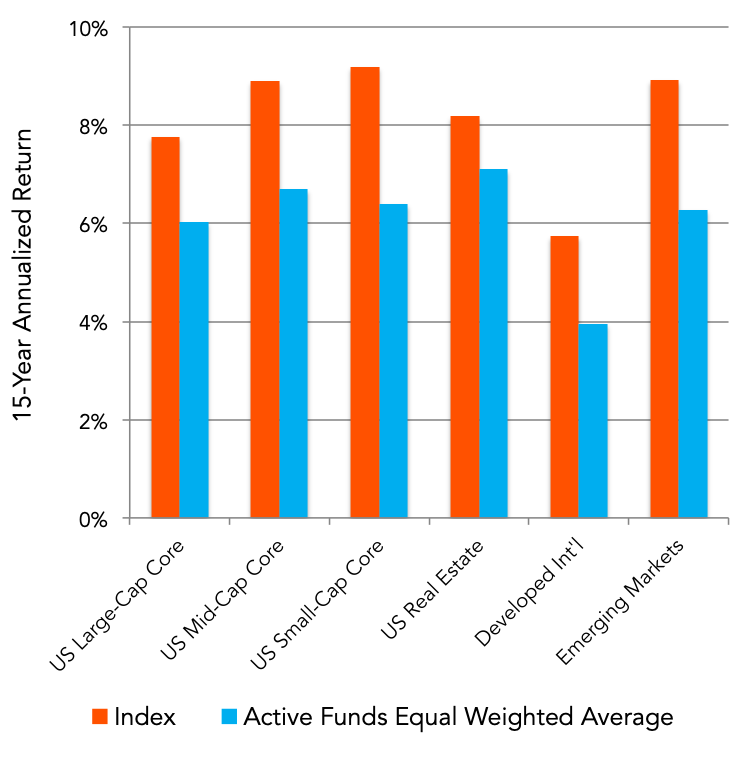 The chart to the right shows how actively managed funds have fared on average (on an equal-weighted basis) versus their respective indexes over the 15 years ending December 31, 2018. For example, actively managed US large-cap core funds underperformed the S&P 5003 by 1.74% annually, on average, over the last 15 years. As with our investment advisory fees, our fund management fees are also among the lowest in the market. Add it all up and you see that AlphaGlider delivers a professionally managed active investment portfolio at less than one-half the cost of the typical investment advisor. a) Total fees includes investment advisory fees and fund management fees, but excludes trading commissions which were not measured by the Personal Capital white paper. b) Personal Capital and AlphaGlider fees based on a client with $200,000 in managed assets; AlphaGlider fund management fee is for the highest cost AlphaGlider strategy, as of December 31, 2018, and is subject to change without notice. Your savings go directly to your annual returns. While seemingly modest in any given year, your savings compound over the years to become serious money. As the chart below demonstrates, our lower costs deliver an additional $50,000 to nearly $160,000 over 30 years on an initial investment of $100,000, versus our peers [assuming 6% gross returns in a tax-advantaged account (e.g. individual retirement account) for all advisors]. a) Assumes client assets are in a tax-advantaged account (e.g. individual retirement account). b) AlphaGlider fund management fee is for the highest cost AlphaGlider strategy, as of December 31, 2018, and is subject to change without notice. c) This is a hypothetical example that is demonstrating a mathematical principle. It does not illustrate any investment products and does not show past or future performance of any specific investment. Investing involves risk, including loss of principal. Custodian fees are the third form of fees that AlphaGlider clients pay. As the name implies, custodian fees are paid to the custodian of your accounts. The primary custodian fees on AlphaGlider taxable, retirement, and trust accounts are trading commissions. We specifically chose an independent custodian, TD Ameritrade Institutional (TDAI), that offers commission-free trades for the majority of ETFs we find attractive. We anticipate that trading commissions on accounts held at TDAI to range between $0 to $100 in a typical year. TDAI does not charge an annual fee on its investment accounts, but does apply customary charges on various services such as fund and wire transfers. The primary custodian fees on AlphaGlider 529 Educational Savings Plan accounts are admininstration fees of 0.19% of assets, charged annually by our 529 custodian, my529. As we only utilize commission-free, low cost, no-load mutual funds within AlphaGlider 529 accounts, there are no trading commissions in these accounts. TD Ameritrade, Inc. is the firm that we use to custody our clients' non-529 plan assets. TD Ameritrade and AlphaGlider are separate and unaffiliated firms, and are not responsible for each other’s services or policies. TD Ameritrade does not endorse or recommend any advisor and the use of the TD Ameritrade logo does not represent the endorsement or recommendation of any advisor. Brokerage services provided by TD Ameritrade Institutional, Division of TD Ameritrade, Inc., member FINRA/SIPC/NFA. TD Ameritrade is a trademark jointly owned by TD Ameritrade IP Company, Inc. and The Toronto-Dominion Bank. Used with permission. "In investing, you get what you don't pay for." Past performance is no guarantee of future results. Investing involves risk, including the loss of principle. Small capitalization securities involve greater issuer risk than larger capitalization securities, and the markets for such securities may be more volatile and less liquid. Specifically, small capitalization companies may be subject to more volatile market movements than securities of larger, more established companies, both because the securities typically are graded in lower volume and because the issuers typically are more subject to changes in earnings and prospects. Investing internationally carries additional risks such as differences in financial reporting, currency exchange risk, as well as economic and political risk unique to the specific country. This may result in greater share price volatility. Investments in emerging markets may be more volatile and less liquid than investing in developed markets and may involve exposure to economic structures that are generally less diverse and mature and to political systems which have less stability than those of more developed countries. Shares, when sold, may be worth more or less than their original cost. 1Mutual funds and exchange-traded funds are sold by prospectus. Please consider the investment objectives, risks, charges, and expenses carefully before investing. The prospectus, which contains this and other information about the investment company, can be obtained directly from the Fund Company or your financial professional. Be sure to read the prospectus carefully before deciding whether to invest. 2Indices are unmanaged and investors cannot invest directly in an index. The performance of indices do not account for any fees, commissions or other expenses that would be incurred.